In year’s to come, wouldn’t you love to be able to watch your wedding in all its full splendor again, experiencing again all of the sights, sounds and details that made it so special the first time around? Now you can, if you’re willing to invest in having a professional videographer film your event. Once your day has come and gone, this video may end up being one of your most cherished possessions. It’s probably hard to fast-forward your imagination ahead to see what you’ll be like in a decade, but if you and your spouse have your own children, as they grow it can be very special to be able to share your special memories with them. While you can certainly describe the flower archway where you exchanged vows and tell them about the wedding cake adorned with fresh flowers, your words can’t compare to the joy you’ll feel when you can show all of this first-hand through your wedding video. Of course your wedding album will provide a visual remembrance of your big day, but your photos won’t offer the three dimensional aspect you can get from a video. That’s why most couples today decide to hire both a wedding photographer and wedding videographer. One of the best ways to find a good wedding videographer is by soliciting recommendations from friends who recently got married. Some wedding sites can recommend videographers who frequently film weddings there, which can be a bonus since the person will be very familiar with the logistics of the location. Or, you can ask your band or DJ if they have someone they often work with regularly. If none of these options are successful, you can look for wedding videographers yourself at local wedding expos, or do a search online for vendors in your area. You can also use the many wedding resource directories available, such as through The Knot, Martha Stewart Weddings, and Brides.com. Finally, you can check with some of the national professional organizations including the Wedding & Event Videographers Association and the National Press Photographers Association to look for members who work in your region. When shopping for a wedding videographer, you’ll want to find someone who also has extensive experience filming weddings. This is extremely important, since it can take some practice and skill to capture all of the important moments of your big day, and to make sure that the lighting and sound will be just right in the final product. You’ll also want to ensure that the person has high-quality and reliable equipment. Many professionals will also bring back-up equipment to your event, just in case there anything malfunctions. It can be to your benefit if the wedding videographer films using several cameras, since this can capture multiple angles and will ensure you’ll get the best final product. Keep in mind that different wedding videographers will have different artistic styles, so you’ll also need to be sure the person you hire will be a good fit for your taste. For instance, some wedding videographers do documentary style, filming things as they occur, while other may stop you throughout the day to stage things to make them look better on film. In addition, some professionals will film the entire ceremony and reception, while others will just capture the highlights. Any of these options can be pleasing, depending on your goals. It can help to see some samples of other weddings the videographer has filmed, and talk to past clients, too, to find out how satisfied they were with their jobs. Just keep in mind that some wedding videographers hire assistants to do the work, so you’ll want to clarify who will actually attend your wedding and be performing the filming and the editing. Finally, always specify what you’re looking for and get in writing what the wedding videographer is offering to perform. Also ask if there’s any overtime charge if your event ends up running behind. Whatever price you agree on should be put in writing so you’ll have proof of your arrangement and there won’t be any questions later. When it comes to filming your wedding day, there are apt to be certain moments that you want to be sure are captured in your video. To make sure you get all of the shots you desire, you can make a list of scenes that you want your wedding videographer to get. Some of the common requests are the walk down the aisle, your vows, the cutting of the cake, special blessings or toasts, the first dance, and candid moments interacting with your family and friends. Some videographers will also include a wedding collage made from still photos of you and your fiancé. If you desire some extra effects like this, be sure to specify this up front. Some couples also hire the wedding videographer to attend the rehearsal, since this can be a good way to get comfortable with the location and at the same time, can provide some good video footage of this prelude to the big day at the same time. 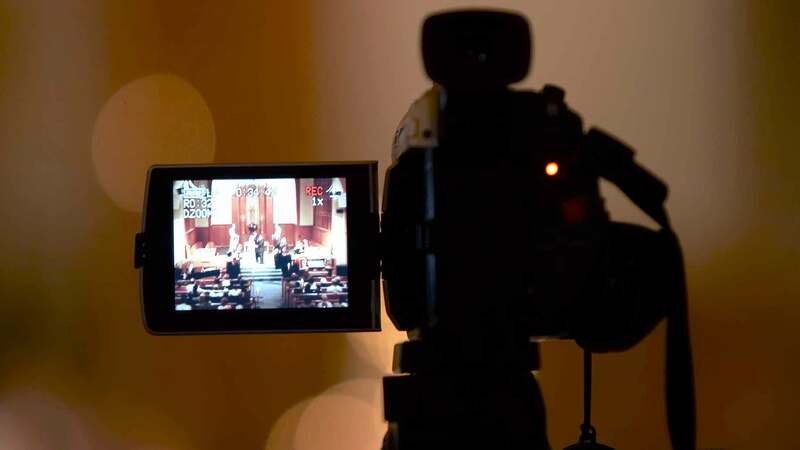 Be sure to check with the manager of the ceremony site to make sure that taping is allowed, since some religious sites and other prohibit video cameras at their location. What you’ll spend on your wedding videographer will depend on exactly what you want and how long you want him to stay. If you want the professional to attend your entire ceremony and reception, this will be much more expensive than if you just want a video of the walk down the aisle and the vows. In addition, more experienced wedding videographers with state-of-the-art equipment will be more expensive than newer videographers who have just the most basic tools of the trade. If your wedding video is very important to you, it can be worth it to invest in someone who is highly qualified and has all of the right resources. Remember that once your wedding is over, if you aren’t satisfied with the final product, there will be little you can do about it. The cost for a wedding videographer to film the most basic wedding video can range from $500 to $1,000. Finally, if you want a full-length wedding video that documents the entire reception, ceremony and even the rehearsal and want it all edited professionally, you can expect to spend as much as $6,000 or more. There are a variety of add-ons you can also request. Some deluxe packages will already include these items in price, but if you go with a more basic package, you can expect to pay extra for each special request, such as include interviewing close friends and family members (at a cost of a few hundred dollars), or bringing a second wedding videographer (in the latter case, you’ll pay in the $100 range per hour.) Most packages come with two wedding videos. If you want to order extra copies, these usually cost between $10 and $25. Keep in mind that the extreme effort and time that’s involved in filming and editing a high-quality wedding video can certainly justify the price. It can take several months for a professional to create a good product, since every five minutes of footage can take as long as an hour to edit. This time commitment, as well as the cost to purchase and maintain the equipment, is factored into the cost of the wedding videographer.